A comment made me laugh. It inspired a blog. There is an 80% chance of a MMI 10 magnitude earthquake hitting the greater Los Angeles area due to a rupture on the southern San Andreas fault in the next 30 years. MMI being the moment magnitude index, and measures shaking strength... For reference Northridge was MMI 9. The epicenter will be far out near the fault's turn to the west. The "big bend". The closest major metro area is actually Palm Springs. The magnitude will be no higher than 8.1, as that is what is considered the strongest a lateral strike fault is capable of producing... 9.0 magnitude mega-thrust quakes are more a Seattle/Portland concern. The strongest on record in Southern California is the 7.9 Fort Tejon quake, back when Fort Tejon was relevant. For argument sake we will use that. What would a 7.9 earthquake with an epicenter 100+ miles from downtown LA do? First you must realize the epicenter means nothing. The shaking is caused by crust movement and if 200 miles of crust slips then the maximum intensity is felt all along that 200 miles... In the case of a San Andreas rupture the stress would be relieved northward, do the western half sliding past the eastern. The projected slip for such an event would likely start out in the desert and follow along the Inland Empire, cut through Palmdale, and on towards Parkfield. 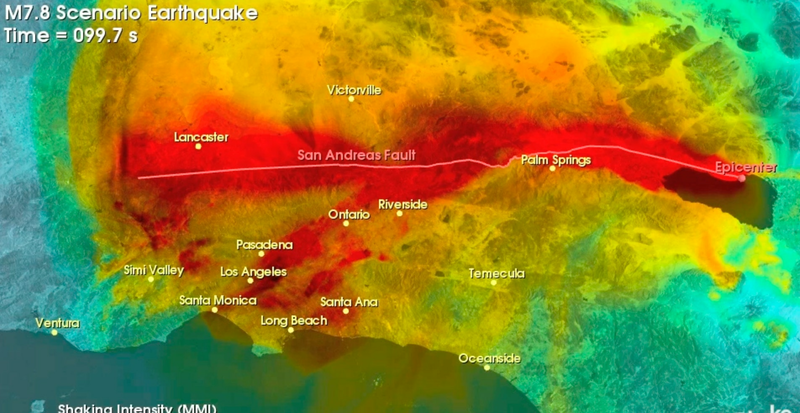 You're within 40 miles of the strongest shaking everywhere in the LA area. Pictured is a 7.8, so that only 100% stronger. L.A. is perfect for this. It's a city built on liquefaction prone Jello. The LA basin actually assists in amplifying the shaking. And there will be much of it, and it will go on for what seems like ever. It will be in waves. It will build, peak at 30 seconds, taper off, and then do it again only harder. The predicted shaking will last between 1 and 3 minutes depending on your location. For perspective, the Loma Prieta 6.9 pancaked a viaduct in Oakland over 50 from it's strongest shaking. The San Andreas "Main Event" will be 31 times stronger than that..
Freeways will collapse, every remaining soft story apartment building in the LA Basin will be tested to it's breaking point, gas lines will rupture, and looting will be epic. When all said and done it will likely be the worst natural disaster in American history. Death tolls are expected to be between one and ten thousand, and losses will be in the trillions.